When your kitten contracts fleas, these small parasites can cause deadly anemia because fleas feed on blood. If your kitten has fleas, you need to get rid of them as quickly as you can and eliminate them from both your kitten and your home. Because young kittens cannot tolerate artificial flea treatments, you need to de-flea your kitten naturally by manually removing the fleas and using herbal products to rid your kitten of these potentially deadly pests. Bathe the kitten in a kitchen sink with lukewarm water and a small amount of natural, unscented castile soap. Lather the soap into the fur and skin of the kitten, avoiding its face. Allow the suds to remain for five minutes; this helps drown the fleas. Use a damp washcloth to wipe the kitten's face and remove any fleas that try to escape to this area. Rinse the kitten thoroughly with warm water, towel dry it, and place it in a box with a heating pad wrapped in a towel, set to the lowest setting. This will prevent the kitten from becoming chilled. Fill a bowl with grain alcohol such as vodka. Place the kitten on a warm, soft towel and use a flea comb to find any remaining fleas on its coat. To help the fleas stick to the comb, coat it with a natural, vegetable oil as needed. If you find a flea on the comb, dip the comb into the bowl of alcohol to kill the flea. Continue to comb your kitten's coat until you have inspected all areas of its body. For very young kittens, the comb may actually be too large. If the comb is too large, use a pair of blunt tweezers to remove fleas. Rub a small amount of brewer's yeast into the kitten's coat after treating it. Use approximately 1 tsp. or less, depending on the size of the kitten. This acts as a natural flea powder and deterrent and is safe for the kitten to eat if licked. Add 1/4 tsp. of apple cider vinegar to your kitten's water bowl to help strengthen its immune system and repel fleas. Vinegar makes your kitten's blood unappetizing to fleas. You can also mix equal parts water and vinegar and apply it as a conditioning and flea-repelling rinse after a bath. Place the vinegar and water mixture into a spray bottle and spritz your kitten's fur, allowing it to dry naturally. Wash your kitten's bedding in hot water, laundry detergent and 1/2 cup borax to kill any remaining fleas or eggs. Vacuum your carpeting, flooring and furniture thoroughly to remove fleas, eggs and larvae from these areas. Wrap the vacuum bag in a plastic bag and dispose of it immediately to prevent any fleas from escaping back into your home. Sprinkle a mixture of equal parts borax and food-grade diatomaceous earth around your home, concentrating on small crevices, behind furniture and bedding. These natural substances will help dehydrate and kill any remaining fleas and flea eggs. Vacuum this powder up after a few days. Wax wood floors to smother fleas naturally. Steam clean carpets to further remove fleas embedded in them. Instead of dipping the flea comb in alcohol, use the sticky side of packaging tape to remove fleas from the flea comb. Purchase food-grade diatomaceous earth from a garden supply store, not a pool supply store, since pool-grade diatomaceous earth is toxic to pets. Keep kittens away from areas containing the borax and food-grade diatomaceous earth while treating these areas for fleas. Do not use essential oils on kittens, as they cannot metabolize these oils the same way dogs can. 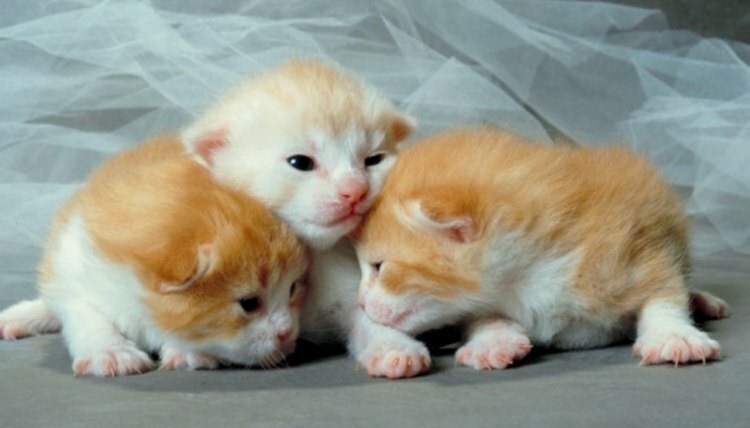 After removing fleas from a kitten, if you have its siblings and mother, you must treat all of them for fleas. How do I Get Rid of the Smell & the Fleas on Dogs for Good?